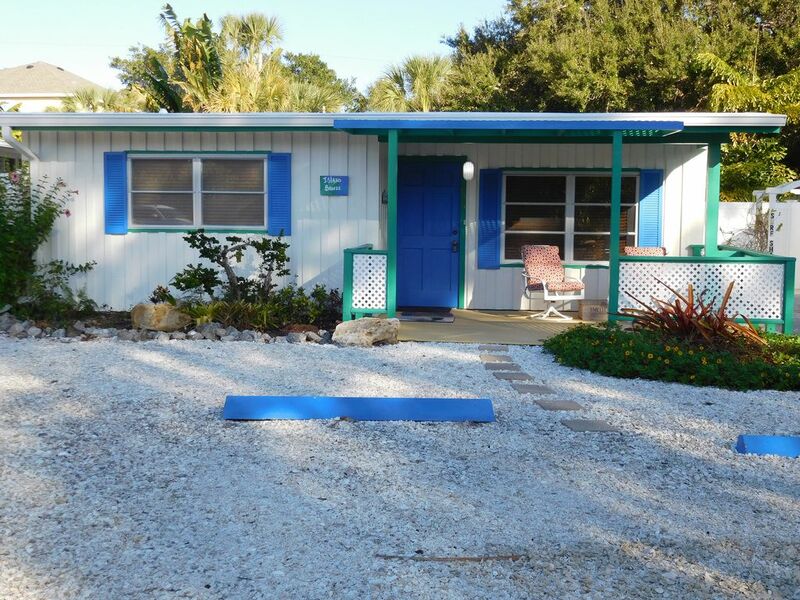 The Island Breeze beach house is a 2br/1bath fully furnished turn-key property which has everything you need. THE BACK AND SIDE YARD IS COMPLETELY FENCED. There is also a separate studio efficency cottage called the Surf Shack on the same property. Information for that unit can be found at the vrbo website with a listing number of 260787 for more information. Both the home and the cottage can be rented together for 2 families or separately. Call or inquire about pricing and availability. This lifestyle will meet your needs whether you are an individual, family, or a retired couple. Located in a quiet residential neighborhood, this home is only 10 minutes walking to world famous Siesta Beach and only eight minutes to Siesta Key Village where you can enjoy the island nightlife, or visit world class boutiques, great restaurants, ice cream parlors or just stroll the village. Among other activities you can do is fishing, boating, kayaking, biking, scooter rentals, etc. This is true paradise living. NEW TO SIESTA KEY IS THE ADDITION OF TROLLYS THAT RUN FROM THE VILLAGE TO THE SOUTH END OF THE ISLAND. THEY ARE FREE. This property features a private boat dock directly across the street where you can fish, crab, dock a small boat or kayak or just enjoy the view. I live less than 10 minutes away so anything that can come up in your stay will be handled very quickly. (NOTE) MINIMUM RENTAL IS AT LEAST 1 WEEK AND PREFERABLY ONE MONTH OR MORE. RENTALS START AND END ON SATURDAYS WHEN POSSIBLE, vacate by 11am, arrival time is after 4pm. Siesta Key is a barrier island on the Gulf of Mexico and is noted for its white quartz sand. Voted one of the top beaches in the world for the last eight years in Travel Magazine, this area is desirable for collecting sand dollars and exotic shells. PLEASE NOTE : ALL UTILITIES ARE INCLUDED with short term rentals. LONG TERM RENTALS DO NOT. tub/shower and outside private H/C shower outside. Vanity with makeup lights. Hair dryer supplied. Off of Siesta Key, downtown is only about 15 minutes and about 20 minutes to St Armands Key. It is only a 10 minute walk to beach Ascess 7. Siesta Village is just a short walk from the house. Across the street from the home there is a private dock which has chairs you can view the water. You can see the canal across the street sitting on the front porch. This is a new central heat and air conditioning system. It also has a wall unit in the diningroom. Plenty of parking in front of home and across the street. Frontier Fios installed throughout the property. bath, hand, washcloths, beach towels. Large with ceiling fan and light, cocktail table, end table extra chairs. Sleeper sofa and love seat. Also a dining area outside on a screened porch as well as outside, both Tropitone sets. also have apple tv router on the living room tv to use if you have netflix account. A few books and paperbacks. A few sand toys left by previous renters. lots of dvds to choose from. There is some beach chairs, umbrellas, air matresses, boogie board and assorted items previous renters have left. This home has its own new boat dock on the Grand Canal directly across the street. I consider this a waterfront view of the Grand Canal directly across the street from the home. I supply umbrellas and beach chairs to take to the beach. There is also a rolling ice chest. A little more information on the television service. I have Frontier Fios which includes high definition tv, 50/50 wired or wireless internet and unlimited long distance. I'm very satisfied when my guests have a good time, the weather is great, and any issues that occasionally pop up I am able to handle. Come back again. Great location and provided everything you need for a vacation! It was real close to the Village which makes it great for dining and other experiences. I loved the quiet walks at night. This porperty has everything we wanted. Walking distance to village and beach! Every amenity. Clean and spacious! Jim gave us all the information we needed to have a comfortable stay! Sweet easy, & very relaxing! Perfect house for our family of 6, all amenities we needed, and close proximity to the beach! We had an amazing time staying at the Island Breeze house! The house was fully furnished with everything we needed to relax and enjoy our time at Siesta Key! Little extras like beach chairs, umbrella, and even a large cooler made trips to the beach so enjoyable! The decor was beachy and everything about the house was so relaxing! Jim is so nice, and even offered up suggestions of things to do around Sarasota. Thanks again Jim for helping us to have an absolutely wonderful vacation! Personally, I am always excited and delighted when my guests enjoy their stay at my beach house. I always like to make their stay as enjoyable and fun as I can. My best compliment that I can get is my guests had an awsome time and they would like to come back in the future.... then I know I must be doing something right. Thanks again for your review. Great beach house in the perfect location! We loved the beach house! It’s down the street from the Village and a bike ride to the beach. It’s completely centrally located. The house itself is great. It’s clean, with a dining room table, a screened patio, a back patio, and a front sitting area. Also a full washer/dryer. The back yard is big and peaceful. We took bike rides and walks at night and it was peaceful. There is a dock across the street which is relaxing too. We loved it. Jim was friendly and answered all of our questions. We will definitely be back! You also can use my dock to launch a canoe or kayak easily. PLEASE IF YOU ARE BOOKING ON LINE CHECK THE BOX IF YOU ARE BRINGING A PET. If you don't the quote will be incorrect and will need to be requoted. Rates are subject to change and not locked in until reservation is completed. Holiday weeks are higher, check pricing. Depending on the length of stay, payments can be adjusted. Also, payments can be made by check or money order.